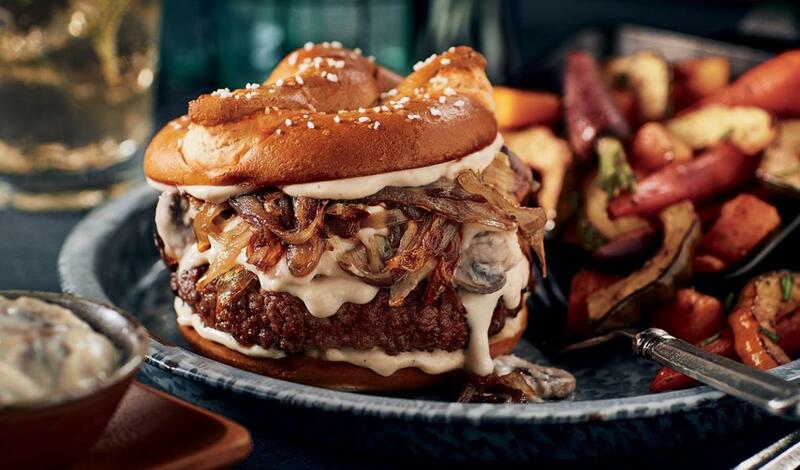 A rich, indulgent fondue and caramelized shallots top a seasoned all-beef patty on a toasted pretzel bun. Finish the fondue by adding in the cheeses. Season to taste and hold hot for service. Combine Hellmann's® Real Mayonnaise with Dijon mustard. Hold refrigerated for service. Spread 1 Tbsp Dijonnaise on each side of the bun. Add grilled beef patty then top with 0.25 cup Smoked Cheese Fondue and 2.5 Tbsp caramelized shallots. Add pepper to taste.